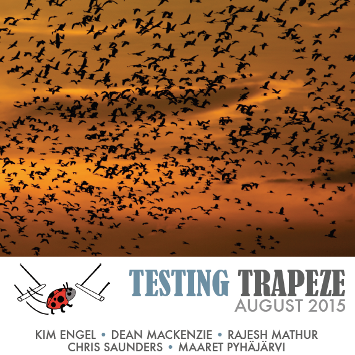 Testing Trapeze and Testing Circus magazines 8/2015 are out and very nice articles are in both. I have talked last week to a release manager about testing metrics and that they are needed inside a huge organisation….hmm…. yes, but…. I could sign that sentence because metrics create visible points but won’t tell the whole story. Daily stand-ups, verbal communication to the stakeholders (mostly also upper management) gives often more information beyond the numbers: They could give a forecast and the management is able to plan actions – hey, that’s what they always want! Yes, metrics are indicators but you have to select metrics very well because team members will try knowingly or unknowingly to get save against the „rules“. The better approach is to give the team members a quality mindset which they are willing to follow and which actions / tasks they should fulfill to get quality product. Then a metric is just a quality control and testers will have more time for the deeper test scenarios instead of getting the basics done.